A popular stop for tourists visiting Boston, the North End is home to the best Italian-American dining options in the city. 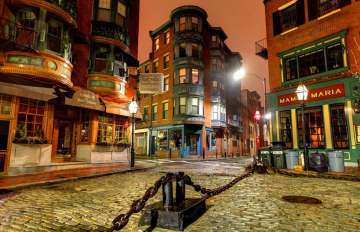 The old word feel of the North End is alive and thriving as characterized by the slanting apartment buildings, narrow alleyways, authentic Italian residents and regularly held festivals honoring religious saints. The close proximity to the financial district and Waterfront draws many young professionals to live in the North End. It’s quite common for residents of this vibrant neighborhood to end their evening with a stroll down Hanover St. making pit stops for cannoli and gelato from some of the best bakeries in the city.